Six months ago an unlikely friendship began in a dusty church basement in South Camden - a basement refashioned into a small boat building shop. 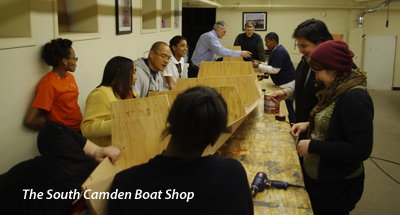 After raising 4 children of his own, Doug decided to volunteer a few hours each week to build boats with young people in the city. Every Tuesday and Friday afternoon, Doug leaves his office in Moorestown, drives 20 minutes to the intersection of Broadway and Filmore, and disappears down the back steps of the old Church of the Savior. Every Tuesday and Friday afternoon Doug enters another world—a world different from the world in which he works, lives, and attends church. Each day Doug crosses a road to cut plywood, hammer nails, and apply Epoxy glue with a group of eager children, he is drawn deeper into their young lives. Over the whining power saws, and clouds of sawdust, Doug hears bits and pieces of their stories. One young man stood out. So the suburban accountant began building a canoe with the paroled teen from the inner city. Like the glue they applied to weld their wooden planks, their common work bonded these two unlikely friends in a unique way. Like so many young people in the city, it is hard to break the strong hold of the streets. This was true for Luis. His heart was right. His intentions were good. He wanted to change. But when temptation sits within a few feet of your front doorstep, it is almost impossible to redirect your life. Because he violated parole, Luis was now looking at 2-7 years in prison. The presiding judge would change his mind only if Luis could find a place to live outside the city. This is what happens when we enter into the lives of others. We begin to feel their pain. We begin to walk in their shoes and enter their stories. The consequence: we feel compelled to advocate on their behalf because they are no longer strangers. Doug’ s unsuccessful attempts at advocacy took him to a deeper place. He began to ask himself why he was calling his friends—why wasn’ t he volunteering? 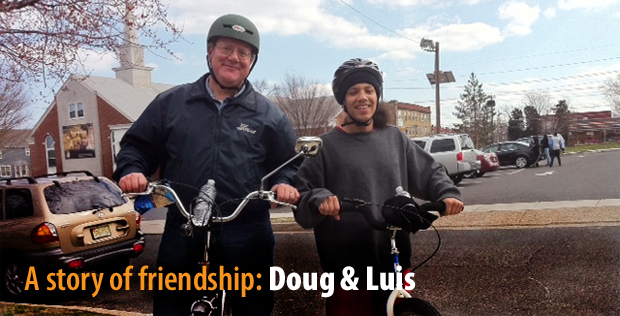 So for the last 4 months Luis eats family dinners, does chores, and spends his weekends riding bikes with the Sell family—an ordinary family who made space in their lives for a young man whose future was hanging on brink of disaster. Doug and Luis are now training together on were out for a 10 mile ride in preparation for an upcoming 50 mile bike race called, Pedal for Promise. Two miles from their car, in the middle of the New Jersey Pine Barrens, it was essential to fix the tire. Doug was struggling to figure out how to change the damaged tube. Within a minute the two were back on their bike riding down the road, continuing their improbable journey together—each learning from one another, each growing into the bigger person God has called them to become. It's Friday night and I receive a text message from one of the kids who signed up to become a team member in the newly formed UrbanPromise Academy Elite Cycling Team. 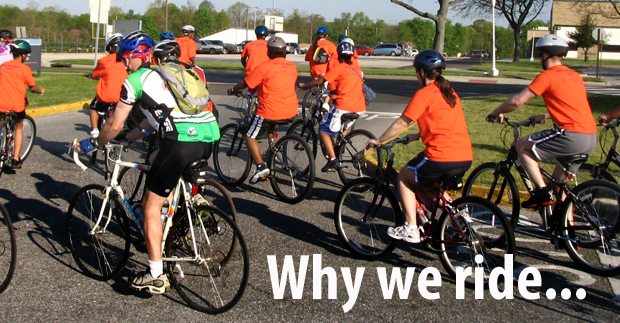 A group of ten students have committed to this twelve week long training regimen and conditioning program that will prepare them to ride in the 50 mile Pedal for Promise on May 7th. The students have made a huge commitment, as for many the disciplines of training, sacrifice, and teamwork will stretch them well beyond their comfort zone. This student is obviously distraught; a close friend he’s grown up with was killed after being shot multiple times last night on Mt. Ephraim Avenue. He tells me he’s not available to make Sunday’s practice and he won’t be able to be part of the team anymore. I text him back that I am very sorry for his loss, but the practice is not scheduled to start until the following Sunday. Afterwards, I begin thinking about some of the events that happen in the lives of my kids. Later that weekend, I pick up one of my students from his home in South Camden and, as he gets into the car shaking his head like only a seventeen year old can do, he grumbles, “My mom, she always says the same three things to me when I leave the house - ‘I love you, be safe and don’t get shot’. ‘Don’t get shot! ?’ I know that, as parents, we have a long list of worries as our teenagers walk out the door on a Saturday night, but for most of us, having them get shot down in the street is not one of our concerns. Back at school the next week, I spoke to the young man who texted me about not being able to be part of the team any longer…I told him I thought the team was part of the solution for him. I told him he couldn’t let the bullets that left his friend to “bleed out” on the street also take him down. He needed to ride for his friend and, even more, for himself; otherwise those bullets would just go on killing more and more young people. So, if you ask me why we ride, I’ll tell you stories about some of the most amazing and resilient young people I’ve ever met. I look forward to sharing the road with you on May 7th and thank you to everyone, riders and supporters alike…you keep us believing! P.S. Click here to support one of our Elite Team Student Cyclists.